Finally! You can play with Deep Space 9 and have little worries that you are going to lose your staffing. Sure, there is the possibility of getting hit with a Hard Time or a Full Complement for a destaffing. 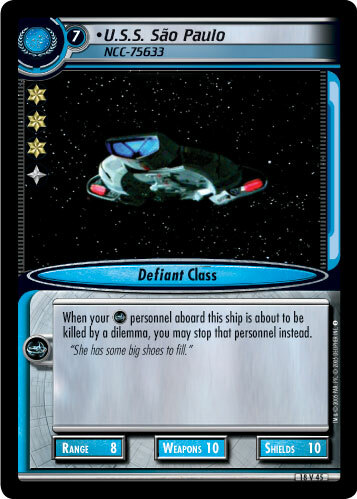 But if you are running with some runabout support, you can leave your headquarters aboard the Sao Paulo, and likely save the counters for another personnel next turn instead of another ship to get your staffing back. There are so many dilemmas out there that kill, that this ship will definitely earn her keep. No more worrying about who the Dal'Rok, Occupational Hazards, Tsiolkovsky Infection, All-Consuming Evil, Contaminating a Culture or Final Adventure is about to kill. Let it come. She does cost seven but in a second, I'll explain why you'll be willing to pay for her. For starters, there are ways of getting additional counters, so you could still draw into her and play her. I don't feel the need to go over them. From there, you simply stock a couple of Emergency Transport Units for a planet mission. Lastly, you play with Walk the Line and a bunch of one-drop chumps. So your opponent is playing with a pile that kills people? You attempt with five from the Sao Paulo with a crew that has the ability to complete the space mission you are attempting with the right four people. (Missions such as Investigate Alien Probe, Protect the Escapees and Investigate Destruction fit the criteria.) Your opponent likely has no options. He will probably have the ability to only stop two personnel, or maybe kill two. With the Sao Paulo and Walk the Line, whichever he plays will have the same result, the appropriate stop is prevented and the mission is completed! After you've done two quick space missions thusly, you can then move on to your easy planet mission. By this time, you will still have the key personnel you need in play and have Emergency Tranport Units to protect them. The ability to prevent dilemma deaths is huge against such strategies as Kruge and Far-Seeing Eyes, and with the Sao Paulo, you've got a great meta counter to that Tragic Turn-happy guy. The weakness in this armor is when the personnel does not have a Deep Space 9 icon. That can either be from the personnel not having the icon to start with or when the personnel was stopped first and lost the icon. For the latter, you'll just need to use Walk the Line first to prevent the initial stop, let the kill happen, turn it into a stop, then prevent that also. They're different actions, so you do get a second chance at a response. Pretty neat huh? If you are going to use this ship, I would suggest leaving the non- personnel in your binders.